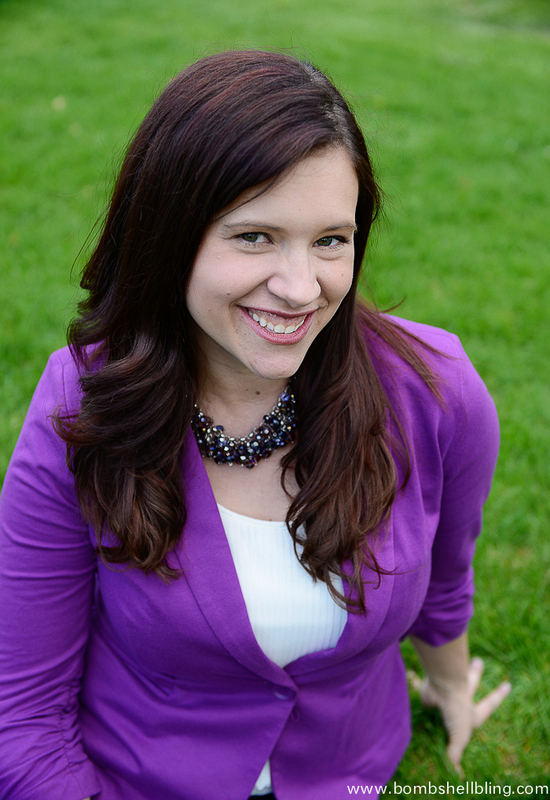 A couple of months ago I got an email from my blogging friend Megan from Brassy Apple. Megan had a vision for a natural, true beauty movement called “I am Brave and Beautiful.” Since Megan is a fashion blogger, her email surprised and interested me. This vision was inspired by Colbie Caillat’s recent song and video called “TRY”. Have you seen it? Go check it out. It’s awesome. In a nutshell, Colbie is singing about how we as women should stop trying so hard to meet the world’s impossible beauty standards and instead take time to truly see ourselves for the beauty that we already have, both inside and out. Colbie sings to us, “Take your make up off. 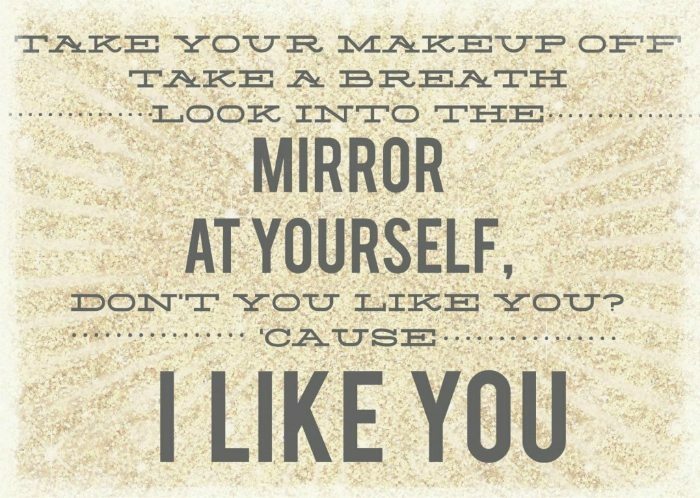 Let your hair down… Look into the mirror at yourself… Do you like you? Cause I like you…” It is a message I have heard before in the past, but usually from my leaders at church when I was a teenager, not from a beautiful Hollywood music star! Colbie’s take on this message is presented in a very moving, visual format. Definitely worth watching! 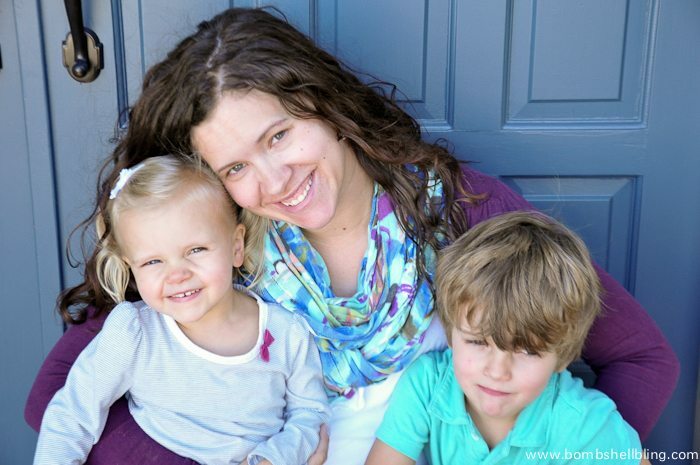 Megan decided to try to spread Colbie’s message by inviting over 100 bloggers from different blogging niches to share what they looked like without make up, along with a bit of their hearts. What makes THEM beautiful, unique, strong, or inspired to be better? What is it that helps them realize that maybe they don’t have to “try so hard” after all? With some trepidation, I decided to join in. It wasn’t so much the makeup free pictures that intimidated me, but the sharing of my heart. I have shared plenty of makeup-free pictures on Instagram, usually snuggling with my kids. If the bags under my eyes are bad enough I sometime put the pictures in black and white. I always feel like that helps camouflage my lack of day-to-day glamour. I could be wrong….. 😉 (Oh, and hey, are you following me on IG? Come see sneak peeks into my life and blog!) What was holding me back was that question: why don’t YOU have to try so hard? What did that even mean? What did it mean to others? What did it mean to me? And did I even want to share my answer? I thought long and hard about how I wanted to answer that question. At first I immediately thought about my struggle with mental illness (you can read more about that HERE if you want to), but that didn’t feel quite right to me. It is a major part of my life, and it does affect how I see myself as a whole person, but something didn’t feel like a perfect fit to me. When I pondered on what people or experiences in my life had taught me the most about true beauty, that struggle did not win out. My mother did. This is my mother. 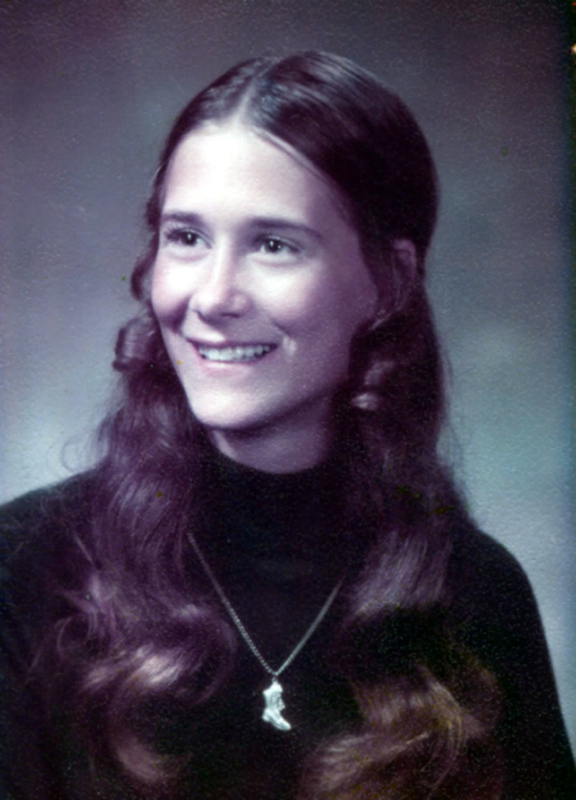 Here she is shown in her senior picture from high school. 18 years old, tan, thin, long shiny hair……what a babe. In the eyes of the world, this is probably when she was at her peak of beauty, and who can blame them for thinking that?! She is truly lovely. But that isn’t the picture of her where I see the most beauty. This one is. Probably not what you were expecting, huh? I can obviously see and acknowledge that 18 year old Mom was more photo op ready, but THIS mom, 35 year old mom, is the most beautiful woman I can imagine. She is a woman who is putting her love for her children above all else. She is a woman who knows that her worth does not lie in her outward beauty, it lies in her heart. 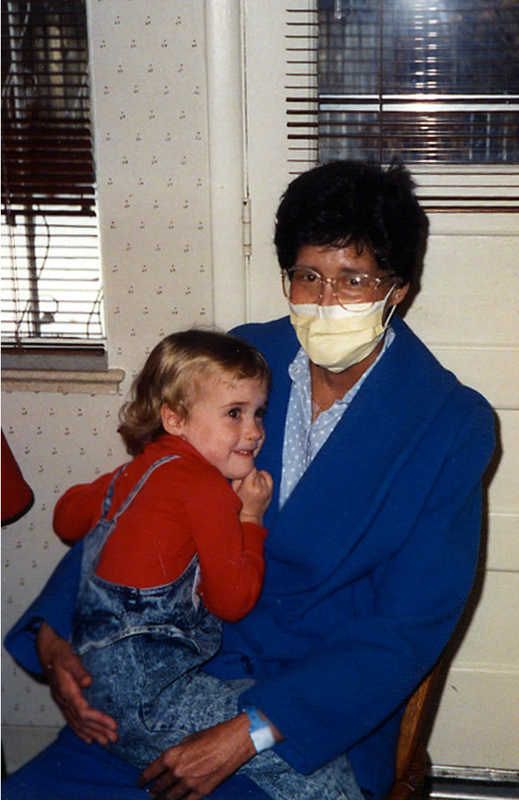 My mother was diagnosed with very advanced breast cancer at the age of 34. I have no trouble telling you that it scares me to think about that as a 32 year old mother myself. Last year I went in for a mammogram and I was a nervous wreck. After all, when she went in she was just doing it to appease her Nervous Nellie mother-in-law who had a strong prompting to take my mother with her to get a free mammogram, despite my mother’s family having no history of breast cancer. The first vivid memory that I have is walking into my parents’ room one morning before school and finding them sitting next to one another on the bed crying. I had never seen my father cry. On came the chemo where our mother’s hair fell out and the bone marrow transplant that was supposed to last weeks and instead took her away for months after her body rejected her own bone marrow. She was blessed with excellent doctors, but she only survived that deadly turn thanks to a miracle from God. You can imagine how three little girls may have felt watching all of this happen. We were 8, 6, and 3. Not allowed to see our mother for weeks at a time, we moved in with our grandparents so that our dad could go straight from work to the hospital. Sometimes we were allowed to visit her for short time periods at the hospital. We stopped by on Halloween because we didn’t want her to miss seeing us in our costumes. Mom came home to us on Thanksgiving Day. 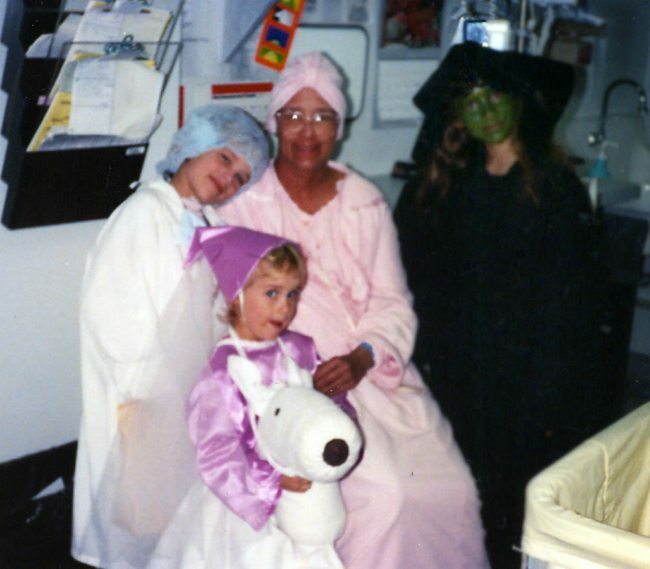 Grandma let us draw on and cut up sheets to make Pilgrim and Indian costumes to wear for her arrival. I remember jumping up and down at the door in my Sharpie decorated, white sheet Indian costume as my dad helped her carefully out of the car. She looked so fragile and so weak, but she was grinning from ear to ear behind her hospital mask. She was the most beautiful sight in the world to us. 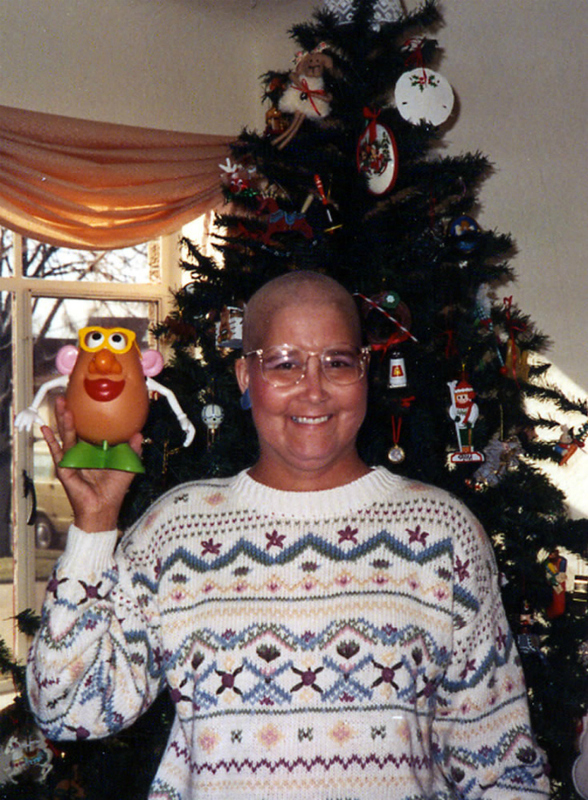 Mom stayed bald for awhile. She was ghostly thin and then blew up on steroids. It was all over our heads. We didn’t know what to think, but we were just glad that she was there to snuggle at night. As was she. 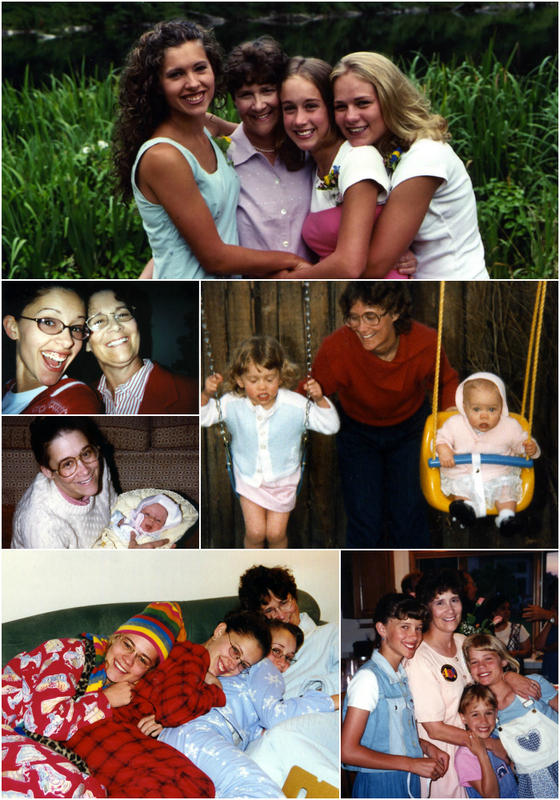 I knew that she had recorded our favorite bedtime stories for us to listen to while she was away for her bone marrow transplant, but it wasn’t until years later that I learned that she had also recorded messages for us to listen to on our 13th birthdays about the things that a daughter may want to ask her mother during that stage of life. During her illness my mother and my father did everything that they could to help us feel love and comfort. One of the things that they did was make jokes about my mother’s changing appearance. To a small child, the changes in her appearance were by far the most alarming and meaningful part of our mother’s sickness. A small child doesn’t understand that a mother is sick when she has a migraine because she looks the same through their eyes. But when her hair falls out and her face swells up from steroids it is very, very scary. Which brings us back to this picture. I love my mother so much. She was such an amazing woman. I am sure that it was incredibly difficult for her to not only be sick, but to lose the outward beauty that she had formerly possessed almost without any effort whatsoever. She went from being one of those lucky women who can eat a whole pan of brownies and still be a size 4 after three kids to looking like Mrs. Potato Head. While her hair did grow back, her figure never returned like that. The bone marrow transplant had put her through menopause in her early thirties, and her metabolism and figure were never the same. I am sure that was hard for her. VERY hard. But, then again, maybe I’m not sure. I assume that it was hard for her because it would be for me! It has been very, VERY hard for me to watch my curls fade and my hips widen after each kid has been born, and I can only assume that my mother felt the same way. But she never said a word about it. I saw her go about doing good. I saw her being a loyal and compassionate friend. 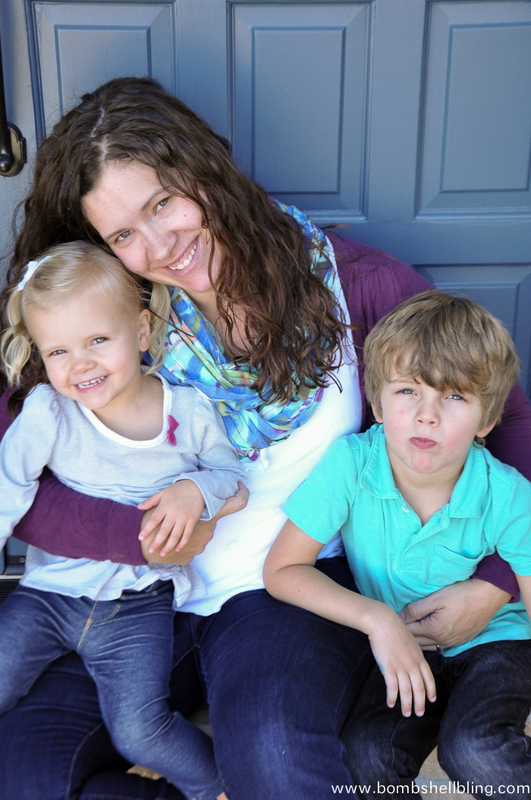 I saw her plan Pinterest-worthy parties for her kids before Pinterest even existed. I saw her devouring good books. I saw her serving in callings in our church. I saw her developing her talents. I saw her gabbing for hours on the phone to her sisters. I saw her driving carpools and cheering for us at every dance recital and choir concert. I saw her reading her scriptures and saying her prayers. I saw her cooking dinner, even though she hated to cook. I saw her gleefully decorating for holidays. I saw her welcoming our friends into her home with open arms. I saw her putting together the best care packages ever. I saw her caring for my grandmother at the end of my grandmother’s life. I saw her loving her husband and her daughters with every ounce of her being. I saw her battle recurring cancer for thirteen long years before she passed away when we were ages 21, 19, and 16. I saw her survive for her family’s sake out of almost sheer determination. I saw her living for the opportunity to raise her children. I NEVER saw her frowning at her hips. I NEVER saw her close to the mirror examining her wrinkles. I NEVER saw her pinching the roll around her waist in despair. Never. I never heard her telling my dad that she felt fat, that she hated her body, or that she was looking old. To me she seemed completely without vanity. She was an amazing, intelligent, accomplished, generous, loving woman. And, guess what? She was beautiful. Beautiful in the eyes of everyone who knew and loved her. That to me is what true beauty means. It means being hard working, loving, brave, compassionate, and striving to be the best version of yourself. She was my mother, and she was BEAUTIFUL. She found so much joy in her role as a mother, and I think that her joy is what made her the most beautiful. My mother was a remarkably happy and stable woman. I admire that about her so much. She was such a rock. She and I have been given different challenges, hers physical and mine mental, but I hope and pray that I have a shred of her strength inside of me. That I will be able to find the courage to fight on throughout my life and to find all of the joy and beauty that there is to be found in my role as a mother. What we see in the world around us may tell us that we need to be perfectly thin, tan, polished, dressed, and made up to be beautiful, but that is simply not how the people who love us see us. Recently I went shopping with my son. I was trying on clothes and feeling wretched about myself. I have been carrying around an extra 60 pounds since I had my children and lost my metabolism, and I can’t seem to get the weight to come off because of a medication that I am on which helps me stay in a good mental realm. I was on the verge of tears looking in the mirror at myself and thinking about that formerly-size-4-without-trying girl that I used to be when my son hugged my legs and said, “Wow, Mom, all of these dresses look so SO beautiful on you.” I hope that he always sees me through such loving eyes, and I hope that, in time, I can always see myself through them as well. As always, I am a work in progress. So, without further ado, here are my side by side “headshots.” One with makeup, one without. Both me. And, in the eyes of those who love me, both beautiful. What about YOU? Are you brave and beautiful? What is it in YOUR life that whispers that you don’t have to try so hard? You can join in this movement too by sharing what you look like without makeup on. You don’t need a blog—just tag your photo with #IamBraveAndBeautiful on Instgram and search the hashtag to see who else has joined in. ALSO, if you tag it with a second hashtag – #ColbieTRY we just might be able to get Colbie Caillat’s attention since she was the inspiration behind it all! Don’t stop here. Get clicking around – this is a blog hop! Below are more brave and beautiful women bearing more than their natural beauty. They each have a little bit of their heart to share with you as well. Some get very personal. Some share stories. For some this was very hard to do yet they gathered their courage and did it anyway. We hope as you explore these posts you will feel the importance of this message and that the empowering effect that it has will encourages you in some way. I am sure you are lovelier than you give yourself credit for, Brenda. Love to you! Oh man! You made me cry! What an awesome example your sweet mom was! You are amazing! Sarah, it was so good to hear from you! I love the dolled-up you, and I love the au naturale you! I’ve had a lot of fun with both. And I agree with your husband that you are glowing in those shots with your kids. It has to be possible to be tired and glow at the same time, because sometimes it’s only after doing something really hard (or in the case of having kids, while doing something really hard for a really long time!) that we have the kind of satisfaction and love that can glow. I cried all the way through this Sarah. It is so beautifully written. I am thankful for you, my sweet and beautiful friend. What a beautiful tribute to your mom, Sarah. I think our moms are kindred spirits up in heaven. The description of your mom and her battle with cancer is so similar to my moms. Although I have fewer memories of all of it since I was only 8 when she died, I remember her looking positively glowing and happy in pictures with me and my brothers. She was amazing, strong and beautiful like your mom. I don’t know that we would have even known she was sick had it not been for the physical changes and all the doctor visits because she tried so hard to keep us from experiencing any of the bad parts. They sound like the same person!!!!!! I am so sad for you that she passed so young!!!!! 🙁 Love you, girl! This was so beautifully written and truly heartfelt. It brought tears to my eyes while at the same time reminding me about so many important lessons as a mom. I love this post and I love the idea behind the whole movement! I’m always thankful to see these messages being spread in such powerful ways. I’m sitting here balling while I’m reading this. I’m so sorry for your loss & going through that at such a young age. I can’t imagine. Cancer is UGLY. Skin cancer took my mom from me last December. 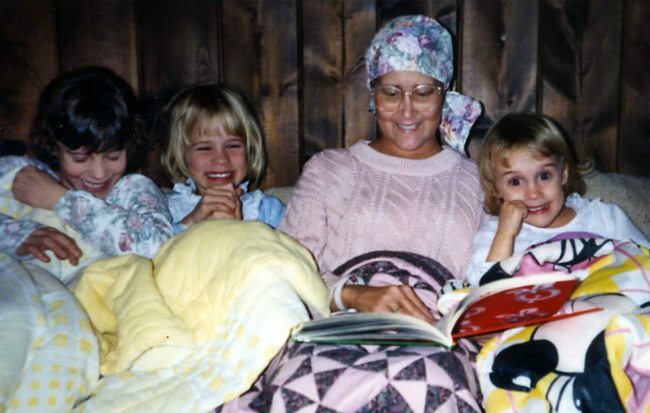 I didn’t watch her go through her treatments – she left us here in Idaho & a month later she was diagnosed. She didn’t want us to see her like that – they never thought she wouldn’t make it through. The next time I saw her – 1 year later, in a hospital bed with only hours to live. I’m not sure how one ever gets to a point of “normal” after that. We just learn to live differently. Love & hugs – losing a mother is something that only those who have gone through it can understand. Wonderful post about her bravery & beauty!! Thank you for commenting — love to you!! !